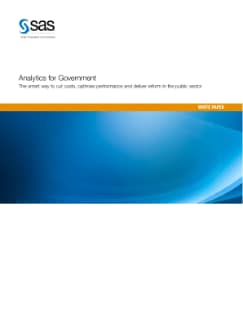 This SAS® discussion document on government analytics describes how the tools we teach and research at Lancaster help meet the challenges of protecting and improving public services when resources are squeezed. The SAS roadmap it describes highlights some of the key lessons learned about successfully innovating with quantitative analytics. 'Quantify', 'Demonstrate value' and 'Benchmark' are among the factors that we also highlight, whether talking with the private or public sectors. Our work with government departments includes forecasting and simulation, since both are essential tools for sensible planning and policy development. For example, courses at the Ministry of Justice and the Department of Work and Pensions have examined how forecasting and risk modelling can be used to deliver better service. Likewise, work with health care organisations has shown the value in these approaches. We've found a willingness to exploit the latest ideas in predictive analytics to deliver efficiencies. In our experience, SAS offers really useful tools with which to design the changed processes necessary if new public sector targets are to be achieved. This is also the reason we've adopted SAS in our teaching to ensure our students are familiar with appropriate tools for the jobs to which they aspire. How are you involved in the decision making process in your organisation?